In an attempt to drag out the beneficial effects of holiday taking, the sequel of my "Organic in Italy" series will take us to the sun-bathed Southern region of Italy, more specifically Naples and Capri. Naples was our New Year's destination, and an ideal destination it proved to be. Every year, the city dwellers (Napolitans? Napoleans seems strange...ideas?) buy ample amounts of fire works in the streets and prepare to provide the city with a personalized pyrotechnic extravaganza, as the city prepares no official New Years celebration or fireworks display. 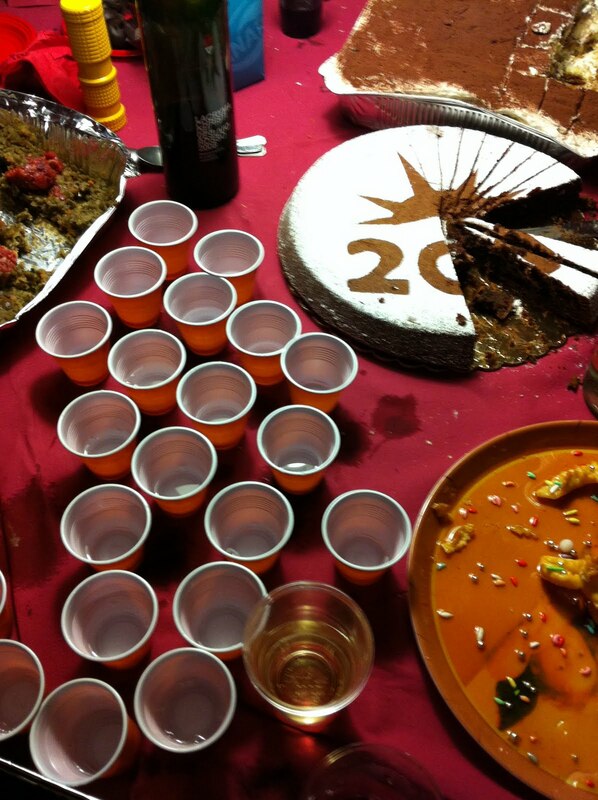 A mixture of celebration of the new year and indignation against the government, the events of this year were particularly à propos as Naples' "waste management issue" (as its referred to in a this Wikipedia article) was particularly noticeable. The trash that piled high around the city's trashcans during our visit was a sign of the poor organization and lack of foresight on the part of the city and it's complicit partners (i.e. the mafia) with regards to this fundamental issue. I do not have anywhere near an extensive understanding of this situation, but from talking to people about the "waste management issue" the horrific reality was hard to believe. For years, the Italian government has been shipping trash to the Naples region, without any sustainable plan for getting rid of it- the result is, as I said, horrific. Trash, including some radioactive and other toxic waste, has been buried under grounds where cows and buffalo used to produce mozzarella (the region's speciality) graze daily. The result is inedible local fare and the governement's response is no less disappointing- consisting essentially of the production of new incinerators and landfills, actions that barely even band-aid the situation. Before we left Rome, a newspaper article reported Berlusconi's promise to have the trash cleared out of the streets before the 1st of January. That was on the 30th of December and we were doubtful of his capacity to follow through with such a promise. Upon arriving in the city of Naples, which is a lively and enchanting city, we saw that the piles of trash that both marred and accentuated the charm of the city didn't seem to be going anywhere fast. So, it is in this state of frustration with an inattentive government and a hope for good things to come in the future that Naples prepared to ring in the New Year. For our part, we prepared by seeing the sites and, of course, eating. Our first culinary delight took place in Capri, where we spent the afternoon visiting a friend of our gracious host. This local Caprisian (?) gave us an insider's tour of the island, a place that would otherwise be rather offsetting with it's overabundance of weekenders wearing sunglasses despite a complete lack of risking direct sunlight in the eyes. Our kind guide immediately dispelled any cynicism we may have approached the situation with, taking us first to Edivino (Vico Sella Orta, 10/A, Capri), a house-turned restaurant that is cosy and welcoming. Once inside, you feel like you've walked into everything a Pottery Barn store ever wanted to be. As we waited to order, a woman came out of the kitchen and grabbed a bunch of apples our of the shallow bowl that was on our table, "for a tart for tonight," she explained, reminding me that we weren't in a catalogue, but a real place, in Italy. While waiting for our food to arrive, we took a tour of the house and its small gardens, which consisted of citrus trees and a fully functional vegetable garden with lettuce and rhubarb and celery just waiting to be plucked and eaten. Among the New Years Eve commotion and preparation, the team at Edivino prepared and served our lunch which, I am sorry to say, I don't have any pictures of, so you'll just have to take my word for how delicious looking it was. 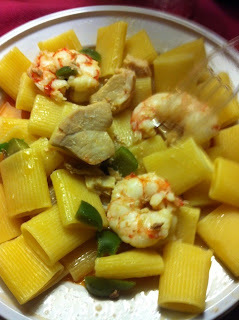 The pasta dish was a simple mixture of a chunky tube pasta with olive oil, hints of garlic, steamed broccoli and white fish. It was absolutely amazing and the sign of good things to come. Back in Naples after a stroll around Capri's Marina Piccola, we had a few drinks at the must-visit activist library/music & photography lovers HQ/bar Perdi Tempo and then set off for more food, this time right around the corner at the neighborhood Vegan and Organic Restaurant, Un SorRiso Integrale (Vico S. Pietra a Maiella 6, Naples). The food at Un SorRiso Integrale was good, particularly the entrée of fried veggies in a paper cone. I had my first cheese-free meal in a while (a nice lactose break) with some good local organic white wine to wash it down. As is often the case with vegan restaurants, the biggest pleasure may be just knowing that they exist. 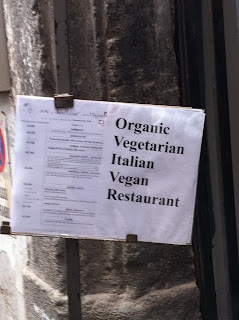 You could probably be more blown away by food in Naples, but I would still recommend Un SorRiso Integrale for any veggie voyager looking to order anything off the menu, instead of a macgyvered veggie option in a more traditional restaurant. The next evening, we were invited to spend New Year's Eve at the home of a friend, celebrated photography and barkeep at Perdi Tempo. I was looking forward to seeing the infamous fireworks from their rooftop terrase while ringing in the New Year with my guy and our amici. What I didn't prepare for was the feast that our hosts had prepared for at least 30 people. The plates consisted of Pasta, an amazing bell pepper salad (the bell peppers in Italy are the best I've ever had), lasagne, a huge plate of tiramisu, and, at midnight, the traditional plate of lentils and tripes which is meant to bring anyone who eats it money in the New Year. Standing on the rooftop overlooking Naples and the dozens of fireworks showering the sky, I was overwhelmed by the little lights shining everywhere, reminders of a presence that couldn't be ignored, at least not that night. In the darkness all we could see were sparks and flashes, and for awhile no one saw or thought about the trash or the streets, we were all looking at the sky. The next day, the main squares had magically been cleared of trash, but as we made our way back to the trains station, snaking through smaller side streets, we saw that Berlusconi still hadn't done anything to help those parts of the city.